Used for Disc and Joint injuries and chronic injuries (over 6 months old) where scar tissue may exist. Wei WHITEE Patches are all natural Chinese herbal patches that are proven to dramatically help restore disc and joint structure and eliminate joint, back, and sciatic pain for people with disc injuries and osteoarthritis. Those over the age of 50 are recommended to take LC Balancer when utilizing the Whitee Patches to help with microcirculation. Whitee Patches are also recommended when addressing a chronic injury that may have scar tissue built up. If you are over the age of 50, you should take 1 teaspoon of LC Balancer 3 times per day while using WHITEE Patches. The joint area should be covered by the herbs. 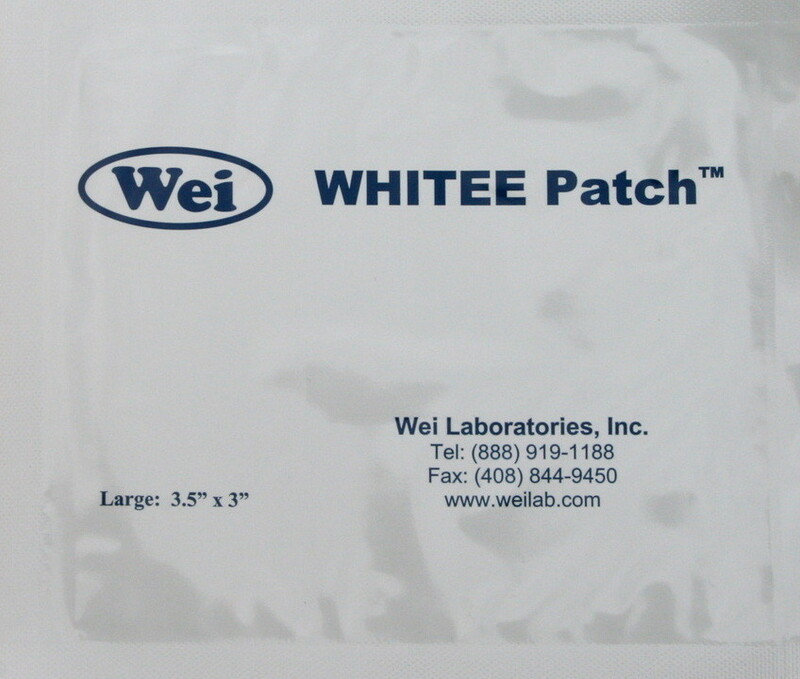 Small WHITEE Patch (1.0 inch x 0.75 inch) – neutraceutical area 0.75" x 1"
Medium WHITEE Patch (2.0 inch x 1.5 inch) – neutraceutical area 1.5" x 2"
Large WHITEE Patch (3.5 inch x 3.0 inch) – neutraceutical area 3" x 3.5"
Contact us if you need help in designing the right protocol for using the WEI Lab patches specifically for your condition. Peel off the paper cover and the apply the patch to the joint area with the herb in direct contact with the clean, dry skin (shaved where necessary). Patients with multiple joint/disc pain should start treating the most severe joint/disc. Patch are worn continuously for 48-hour (2 days). Remove the patch to give the skin a 24-hour (1 day) break before applying the new one to avoid skin irritation. The tape is water proof so patients can shower or swim while wearing the patch. Usually patient will feel relief after treatment with 2-3 patches. Patients with swollen joints may experience extra fluid under the patch during the first 2 to 3 patch treatment. Remove the patch and wipe off the fluid using tissues, then reapply the patch to the joint area. 1. After removal of the patch, if there is herbal paste left on the skin, apply some vegetable oil or any cooking oil, wait for 1 minute and then wipe it off using tissues. 2. If it is difficult to remove the tape from skin, please use soap to wash it off..
3. 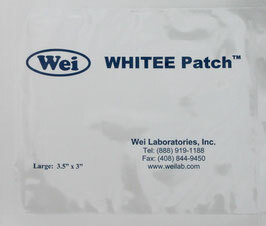 The WHITEE Patch is a latex-free product. However, after prolonged use local skin rashes may develope in the treatment area. If rashes occur, remove the Patch and apply Antihistamine ointment to cope with itching. Avoid scratching. If the patient happens to scratch the rash and break the skin, apply an antibiotic ointment to avoid bacterial infection. If patient is sensitive to the supporting tape, cut off the surrounding tape and wrap the patch with an elastic bandage. 1. Avoid using ice or cold compresses in the joint/disc area. Heat pad will be helped. 2. Avoid using WHITEE Patch on injuries with damaged skin including scuffs, scrapes or scabs. 3. Pregnant women should not use the WHITEE Patch. 4. People with super sensitive skin should avoid WHITEE Patch. If patients get swelling lymph nodes after using the WHITEE Patch, it may due to allergic reactions to the herbal ingredients and should stop using the WHITEE Patch immediately. The WHITEE Patch is composed of twenty different herbs with specified appellations. All herbs are currently available but uniquely selected, prepared, treated, and processed.